By Amanda Glenn 13 Comments February 17, 2019 This post may contain affiliate links. 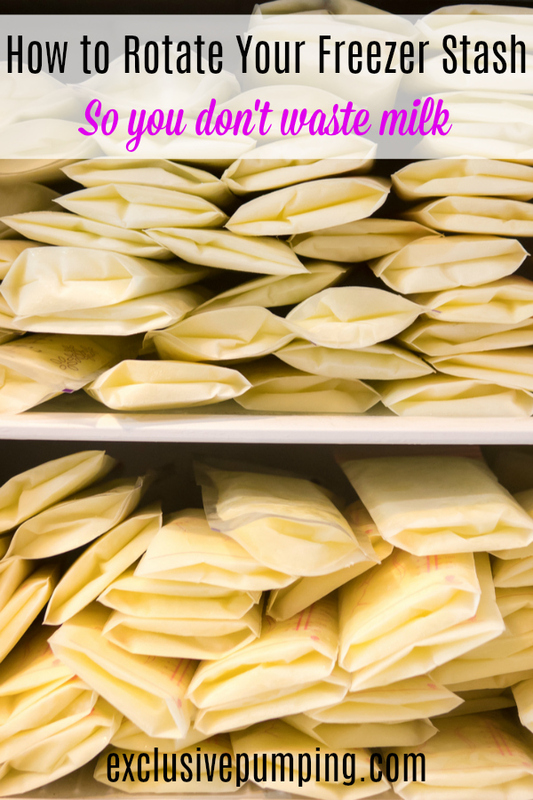 If you are an exclusive pumper that has enough supply to pump extra milk, it’s a good idea to start freezing your milk in breast milk bags and building up some breast milk freezer storage. Breast milk doesn’t last in the freezer indefinitely, though. Here is how to help make sure you don’t waste any milk by rotating your freezer stash. How long can breast milk be kept in the freezer? Therefore, depending on the type of freezer you have and how old your baby is when you start freezing milk, your milk might not last as long as you need it to. For example, if you start freezing milk in your baby’s first month in a “normal” freezer (attached to a refrigerator), that milk should be used by the time your baby is 7 months old. If you plan on pumping past that point, you need to have a system in place to use the old milk before it goes bad. This is where rotating your freezer stash come in. Rotating your freezer stash means using the oldest milk that you have on hand to feed your baby while the newer milk that you pump goes into the freezer to replace it. How consistent you need to be about rotating your freezer stash depends on what kind of freezer you have. If you only have a freezer compartment, you’ll need to be constantly rotating what you’ve frozen. If you have a deep freeze that you rarely open, milk rotation is less of a concern since your milk will likely still be good as long as your baby needs it (i.e., until they turn a year old). With a freezer attached to a fridge, you’ll need to rotate on a somewhat regular basis. 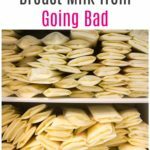 Rotating frozen breastmilk: How should I use my freezer stash of breastmilk? Pick a day each week where you baby only eats the oldest breast milk that you have frozen, while all the milk that you pump that day goes into the freezer. So, for example, every Monday is frozen milk day. This is a pretty simple way to do it – you can even do all of the defrosting for Monday’s bottles at once on Sunday night and all of the freezing of Monday’s pumped milk on Tuesday mornings. Every day, give your baby one frozen milk bottle (say, their pre-bedtime bottle), while freezing the milk that you pumped for that feeding. One advantage of this method is that your baby still gets fresh milk, with all of its antibodies, every day. The main disadvantage is that you have to deal with defrosting and freezing milk every day; fresh milk is easier to deal with. When should I start using my frozen breast milk? You should start using frozen breast milk right away. Some women have a lipase issue where their milk starts to taste bad after some time passes. (For these women, fresh milk and even milk that’s been refrigerated for some time may taste fine to their baby, but milk that has been frozen tastes soapy – and baby won’t eat it.) 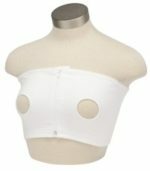 There is a way around this – you can scald your breast milk after you pump it – but once the milk is off, it’s off. Don’t build up a huge freezer stash of milk your baby won’t drink – start using it right away, even if it’s just a few bottles a week to rotate out old milk. 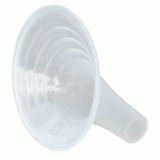 Is there anything I can use to make dealing with my breast milk freezer storage easier? Freeze your breast milk flat (like bricks) – they take up less room this way. In order to know what milk is the oldest, you’ll want to make sure that you label the breast milk bag with the date (if you’ve combined milk from more than one day in the bag, use the earlier date). You can also use Milkies Freeze, which has a “first in, first out” system for storing the milk. If you’d like to track the amount of milk that you have in your freezer, check out the Milk Maid app – it will tell you how many days of breast milk you’ve got stored up. 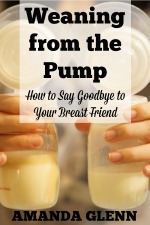 Finally, as you rotate your milk, if you find that you have too big of a freezer stash (i.e., no room for grown-up food), you can consider donating your breast milk to a milk bank or donating it informally. I started a freezer stash when my baby was a month and a half old. He is now 3 months. I was told that I should use the milk from when he was a newborn now because it will not provide the nutrients he’ll need when he is older, say 5 or 6 months. Is that true? Hi, may I ask about freezer stash please. while I was leave. I mostly pump now and then leave it to the next feed for my baby. So baby feeds on fresh pumps every day. The balance milk from the pumping session will be put into fridge and then at the end of the day, I Will gather all the cold bm and then freeze it in about 4/5oz (quantity) per bag. 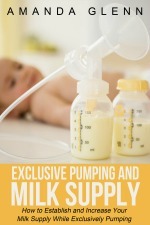 Reason being I had enough supply to feed my baby after each pump and still have balances. So with this over about 3 months I built up quite a big of freezer stash. My baby was born in June. So now I am back to work, baby gets 2 fresh pump of bm from my wake up pump in the in the day. However, for the rest of the day baby drinks from my freezer stash. Now is the month of October and baby is feeding on my August frozen pump (oldest batch already). I am not sure if this is correct but somehow I have to use those frozen stash isn’t it? Otherwise the 3-6 months time limit will be up soon and my freezer stash will be wasted. So the thing is so long I’m not at work such as on weekends. I’ll pump and feed baby fresh pump (not cold/frozen). Then the rest of the pump, I will have to freeze it. Only when I’m at work then I give baby frozen stash. So based on the above, my baby on working days usually drinks bm that was pump roughly about 2 months ago. Baby is feeding 150 every 3 hrs. His last feed for the day is about 9-10pm and first feed is about 5/6am the next day. Yes, that shouldn’t be a problem! I would just use the normal freezer guidelines then. You can also donate it to hospitals. For EPers, does the milk change with the age of the baby, I.e. do I have to worry about feeding milk from when my daughter was 1 month old to her when she’s 5 months old? Hi Janine – it does change a bit, but not enough that you should worry about it at all. I was wondering the same. My baby was very gassy and had an upset tummy throughout the day until about 8 weeks. I read about rotating your stash, so I’ve started that now at 12 weeks. I noticed she’s fussy again! I’m wondering if I should toss the earlier stash to avoid the tummy issues but I hate the thought of wasting so much milk. Is it possible the older milk is different and hurting her? Side note: I thought it was the bottles for the longest time, but now I see it was the milk all along. Could have saved a lot of money trying all those different brands 🙁 argh!